So, here it is, finally. :) We've been working hard to realize this volume of the compilation series and here you go with 98 tracks and a running time of 7h39m! :) The download will give you a player that is runnable locally (should be working on Mac/Win/Linux, but I have not tested it everywhere) and it includes the 320Kbps MP3 versions of all of the tracks. all the YES i have! Nice interface and good music. Great tunes, runs in browser. Massive would be an understatement. This is the latest and greatest music the scene has to offer. You definitely do not want to miss this! Quoting Abba: Thank you for the music! Tons of tunes and some scrollers to read. Fine interface. @ziphoid - tried different formats, engines. 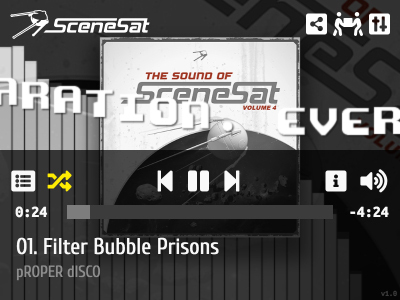 etc.. Flac and Web Audio seemed to work best for reducing the scratchy noise, nothing solved the fail-to-play issue. So happy to see such a great, big fat music disk in my browser. Awesome tunes by loads of awesome artists! Totally rules! Some really great stuff in there! Wonderful collection. Thank you for all the work you put in there, Ziphoid! Listening to mods since Amiga days, this compilation is really disappointing. Then Jogeir has arrived ! Childhood is the quintessence of computer music, a job well done by a talented composer, who knows how to make his listeners content and jubilating. We wish to thank warmly Jogeir for his numerous masterpieces (Living in a Dream, Variations, Mixified...). Great stuff! And quite a lot of it! Some sweet bio-digital jazz in there man! Awesome! Love these music compilations! page created in 0.021971 seconds with 15 queries.